This unit is the very first of our fully interdisciplinary PBL curriculum. The theme for this unit, Bridges, focused on connection & support. We’re asking questions like ‘Can we cross all bridges?’, ‘Why and how are connections important?’, and ‘What makes a strong bridge?’. Working in groups, students are creating projects of individual interest, inviting authentic audience members and experts to participate in the process. Tinker/Discover- this first phase lasts approximately two weeks, and includes LOTS of brainstorming and idea-making activities. 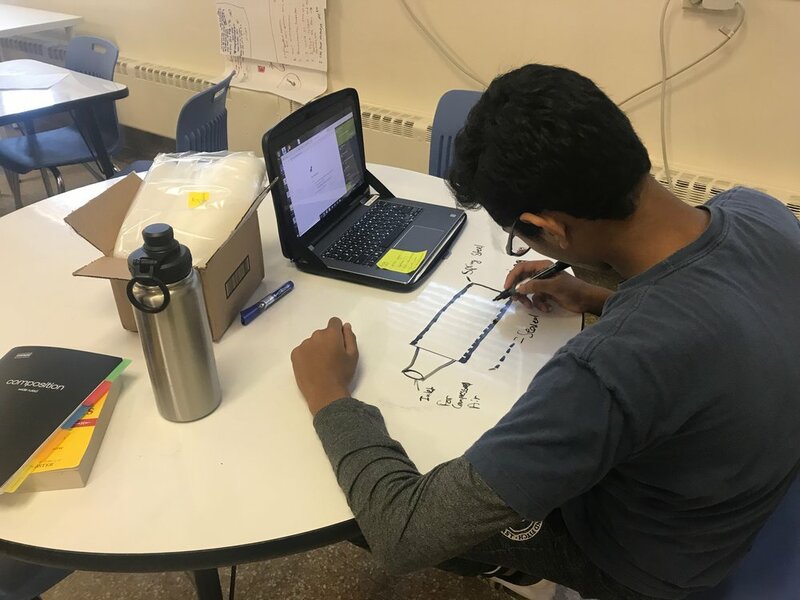 Students work to unpack the theme on their own before experiencing an ‘Information Blitz’ followed by Foundational Lessons from each of our Middle School teachers in their respective areas of expertise. Using the QFT (question formulation technique) students start to discover and explore the theme through questions they have, often based in their personal areas of interest. Create- as students begin the ‘Create’ phase, they are required to complete a project proposal, budget and prototype that are approved by the teaching team. Then they dive right into research, gathering information that will unpack and explore their individual driving question and their group’s overarching question. They have specific requirements for their deliverables, including a ‘Blended Genre Research Paper’ and a creation of their choice. This phase lasts approximately 4 weeks. Present- having students prepare for and give presentations is an essential part of their learning in the Middle School program. Students give at least one presentation for each phase of our unit. Sometimes they are very brief ‘mini-presentations’ and sometimes more elaborate. We want students to be comfortable speaking in front of others, organizing their thoughts and ideas, and preparing any materials needed. We also practice giving and receiving constructive criticism, and crafting interesting questions to ask during a presentation. Students spend about a week sharing their project presentations with one another once the ‘Create’ phase is complete! Reflect- it’s been proven through recent brain science that learning happens when ample time is given for reflection. Students follow up the ‘Present’ phase with a full week of reflection. During this time we complete self-assessments, peer-assessments and teacher assessments, and share our learnings as a group. We also work to archive and organize all of our research, materials and media from the creation of our projects so they may be referenced later by future students. Here are some images from our tinker/discover phase! To the left is our whiteboard session brainstorming all of the meanings & interpretations of bridges. We use a ‘Tinker Activity’ to kick off our unit- students are given a challenge to complete in self-assembled teams with limited constraints. It’s a chance for them to think critically, problem solve and collaborate. It gives the teaching team an opportunity to observe students as they work individually and as a team and start to identify their strengths, weaknesses, and personalities. In this activity, students were challenged to build a bridge using a set amount of cardboard tubes, string, tape and lasagna noodles. The field notebook is an essential part of our PBL approach. Students were each given a Field Notebook at the start of the year. It’s expected that students use this notebook as a daily journal for notes, ideas, learnings, questions and research. They are free to use any combination of writing, drawing, doodling, sketching and pasting/taping in information. We have weekly Gallery Walks to share our favorite pages and learn from one another. Students work through a series of steps in the QFT to identify possible areas of exploration for their projects. After defining an area of interest within the theme, students create idea boards that we share during a Gallery Walk— all students and teachers have an opportunity to leave notes with thoughts, questions, additional ideas or opportunities for collaboration. These idea boards eventually become a student’s driving question for their project. Projects during this unit range from physical bridges to VR and from football to brain science! Students work to find teammates whose driving questions relate to theirs. Ultimately, they define an overarching question that acts as an umbrella over all of their individual questions. We bring it all together in an Ishikawa or ‘fish’ diagram. this shows how ALL of their individual and overarching questions work together, driving toward different elements and understandings of our theme. During this unit, we had students focused on Sociology, History, and the Virtual and Physical. Why and how do people assume a gender? What is the relationship between the creator and the viewer in books and films? How can the virtual world make for better military efficiency in training & combat? What is the relationship between the designer and the builder of a bridge? Students work daily (Monday-Thursday) from 1:15-3:15pm on their projects. They might be building, drawing, receiving a lesson or connecting with an expert in the greater community. Below are some images of our students hard at work. Six groups worked collaboratively during this project cycle, linking their individual driving questions to an overarching team question. Students were required to create an individual project of their choosing as well as work together with their team to create a blended genre research paper. Alex, Michael, Nikita & Sadie with their blended genre paper, hot off the press! Can we cross all bridges? 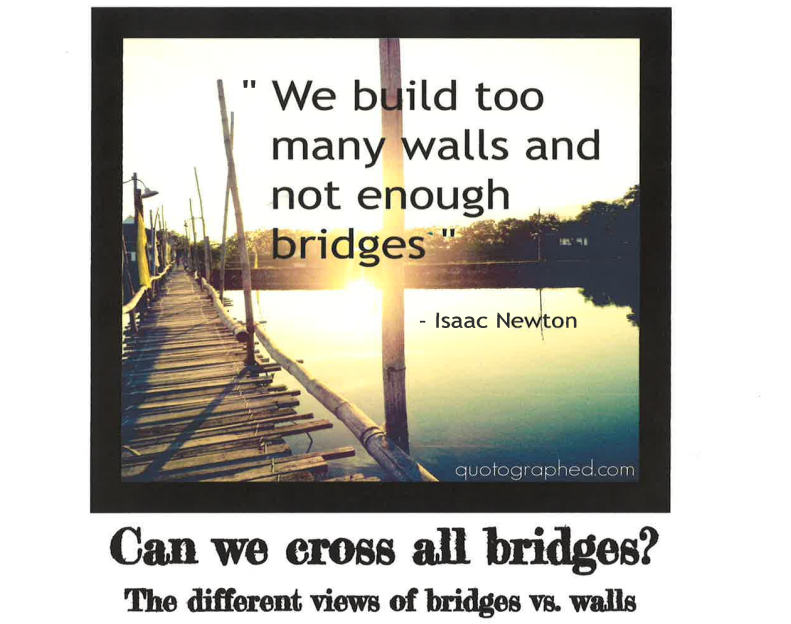 In this project, students came together through one student’s question— can we cross all bridges. Individual student interests included space & time, canine evolution, the United Nations and the refugee crisis. Initially, the group tried to find common ground among their topics through a particular country, Syria, but soon realized that backward engineering their questions into a specific topic proved too limiting. With some amazing ‘Start with Why’ workshopping, the group came to the conclusion that ‘Can we cross all bridges’ was their overarching question, which brought up the theme of bridges vs. walls. They chose to explore this theme in the context of their individual questions, creating this movie as well as an incredible blended genre paper. Dev, Taylor and Lucas were a great team for this first project! How do you build a strong bridge? Students in this group were most interested in physical bridges, choosing to explore questions like ‘What is the relationship between hardware and software in bridge building?’, ‘What is the relationship between the designer and builder of a bridge?’ and ‘What makes a bridge strong?’. This group researched different bridge types and worked in Pro-Engineer to create multiple design iterations before building their bridge. They even worked to identify a location for their bridge! Their working prototype was a highlight with the class during our group presentations, as was the stopmotion video they created of their bridge in action. This team’s blended genre paper was thorough and proved their subject was well researched. How can the virtual world improve military efficiency? Arjun & Ellis were clear from the very start that their questions about bridges connected the physical and virtual worlds. 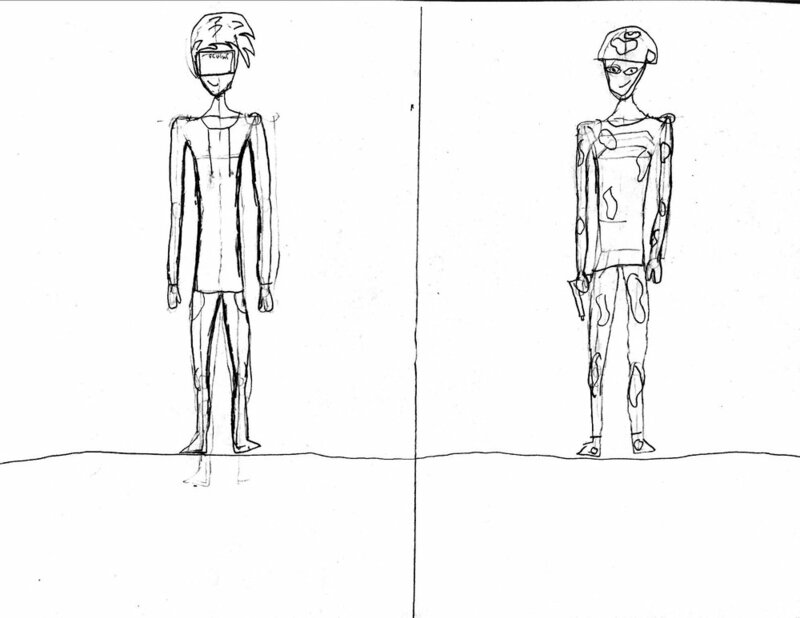 Both inspired by gaming, they took very different approaches to discovering how military efficiency could be improved. Inspired by the paraglider in Fortnite, Arjun worked on a prototype wing that would allow for a smaller, more compact and more effective paraglider wing. He learned to use a heat sealer and completed a successful prototype. Ellis loves virtual reality, so after researching how the military uses VR in training, he decided to conduct an experiment and interview with a member of the armed forces. Despite very different approaches, this team was successful in exploring elements of a greater theme together. What is the relationship between us and the media we prefer? What is the relationship between the creator of a work and the person experiencing that work? What draws us to different types of work like Adventure, Fantasy, Horror or Comedy? How is our identity expressed through avatars and online characters? Preferring physical materials over digital, this team created a fantasy board game as well as a character development chart. Their work was artistic, creative and unique, and certainly made connections across many disciplines! How is football a bridge? How does a win or loss at the Superbowl affect merchandise and ticket pricing? How does it feel to be a fan that is geographically separated from your team? These questions led Adithya & Max to explore a number of ways to gather information. They aimed to be original and unique while also contributing something meaningful to these topics. Adithya interviewed some fans who live far from their teams’ home fields and created a podcast, which you can hear below. Max’s research inspired him to create a graph of merchandise and ticket prices. Why does our brain make the decisions it does? This team consisted of Luka, Leeraz, Adrik & Gabriel, all whose questions and interests fell into the area of Sociology— why does my brain think the way it does? How does the media affect what I think and feel? Why is some media publicized in the news more than others? When and how did people start affiliating themselves with a gender? These fascinating questions led the group through a deep and sometimes confusing journey during their research, with some members of the team struggling to keep their question intact and in focus. Two members of the team, Leeraz and Luka, chose to create webpages to showcase their learnings. 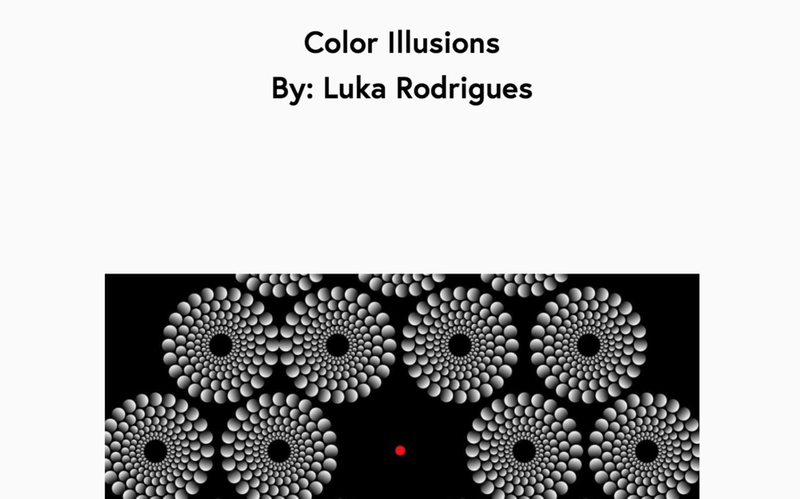 Luka chose to focus on optical illusions, and how the brain perceives them. He was able to reach out to an expert in the field that gave him specific resources to look at, which encouraged him to create his very own illusion! Luka strengthened his creativity and stretched his boundaries by learning how to make an illusion AND build a web page. Leeraz’s focus was on why the media covers certain stories or topics more frequently or in more detail than others. 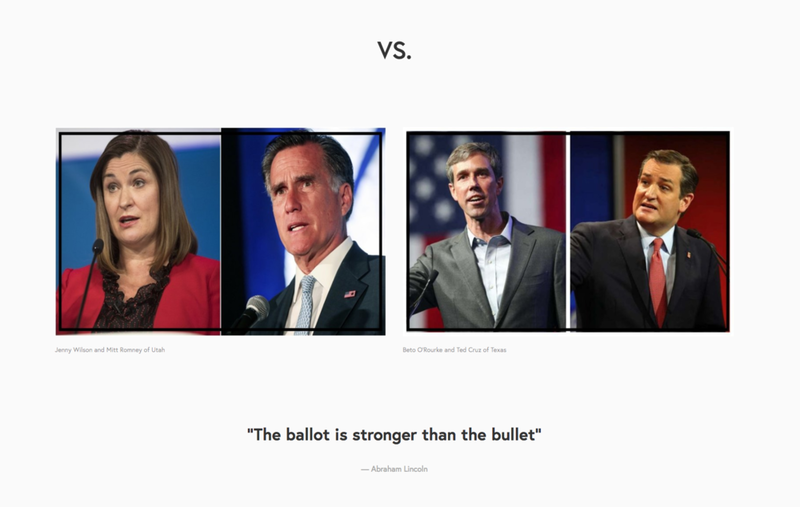 Given the timing, she chose to look at the midterm elections, comparing some of the key races around the country. She too was able to connect with a local journalist who provided some great insight on the process for her and she also learned to build a webpage on her own!